Apple TV+ will be an immediate competitor in the streaming TV business, but investors won't need to pick the winner of the streaming wars to profit. One cord-cutting company is going to be raking in cash as the streaming competition heats up. Of course, all streaming TV services have contributed to our worldwide shift from cable to wireless; fierce competition between Hulu, Walt Disney Co. (NYSE: DIS), Netflix Inc. (NASDAQ: NFLX), and Amazon.com Inc.'s (NASDAQ: AMZN) Prime Video has elevated quality in a market where "content is king." And Apple Inc. (NASDAQ: AAPL) certainly has the cash to become an immediate leader in the content space. It demonstrated this at its March keynote address, bringing Steven Spielberg, Oprah Winfrey, and a host of other celebrities on stage to unveil its new Apple TV+ app. Each guest spoke to their upcoming contributions to Apple's catalog of original content. Apple TV+ promises only original content, for now – no third-party movies or shows – but it will offer the ability to integrate your HBO, Starz, and other subscription streaming services. The lack of a back catalog makes its competition with Amazon and Netflix tougher, but the potential for Apple to add third-party content in the future will even the playing field. And make no mistake, there is a reason some of the biggest tech companies on the planet are fighting for streaming supremacy. Consumers are quickly turning toward streaming options either to supplement or replace traditional cable and satellite hookups. Netflix already has a global subscriber list of 139 million people, while Amazon is gaining ground with over 100 million subscribers to its video service. Apple is clearly looking to harness the streaming movement to add even more profit to its bottom line. Plus, a study from PricewaterhouseCoopers showed only two-thirds of American households still subscribe to cable or satellite today. And that figure continues to shrink. 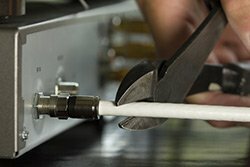 Last summer, analyst firm eMarketer found the number of consumers leaving their cable and satellite companies for cord-cutting options had grown by 32.8% to over 30 million. The age of streaming options is in full swing, as more content and smart devices – not to mention the higher speeds of 5G networks – are added to the mix. But we don't need to pick the winner of the streaming wars to profit. This sort of competition between tech giants is going to be a huge catalyst for one other tech stock. You see, more quality will be a huge boost for cord cutters who can replace their cable subscriptions with even more content. And as people move away from their cable boxes and toward streaming services, this company stands to benefit the most. That's why it's going to get a big jolt from Apple's success. In fact, Money Morning Executive Editor Bill Patalon, a 22-year investment veteran, calls this "one of the best next-generation growth stocks on the market."